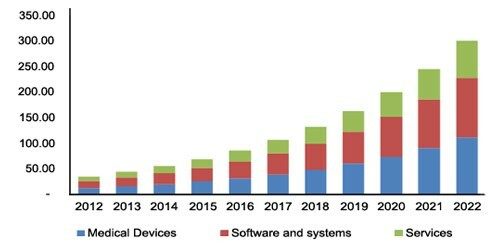 Researchers predict that by 2025, there will be 20 to 30 billion connected devices globally. The global market for industrial IoT will likely reach $14.3 trillion by 2022. In North America alone, the market for IoT in healthcare is projected to reach $300 billion by 2022. Thus IoT has already come to virtually every field in engineering. For engineers, the explosion of IoT-enabled devices offers exciting opportunities. It also presents new challenges, from more complex design considerations to a greater volume of product performance data to manage. From the design of IoT components themselves, to an increased demand for systems engineers, the IoT certainly provides opportunities for the engineering industry. As more and more devices are being connected, engineers have unprecedented opportunity to design sensors, antennae, and even networking devices like routers that power connectivity. Meanwhile new connectivity and networking technologies are emerging (such as the wireless transmission of electricity), which will offer additional opportunities for engineers who wish to remain on the cutting edge of the industry. IoT-enabled devices are constantly collecting performance data. That data has obvious applications for the end user. For example, production machinery provides data that can be used to calculate overall equipment effectiveness (OEE) on the factory floor. Or wearable devices might provide easy-to-understand health metrics for consumers. But on the production side, all this data can be equally valuable because it shows how products actually perform in the real world. Engineers can use the data to proactively improve the design of future products. Using data in this way can result in shorter, less expensive product development cycles by enabling the creation of better prototypes from the very start of the design process. A connected device no longer operates in a vacuum; it operates as part of a system along with everything it connects with. And consider Metcalfe’s law: three interconnected components mean three possible connections; four components mean six potential connections; and ten components have 45 possible connections. Now imagine the incredibly complex ecosystem of an Industry 4.0 factory, with potentially hundreds of IoT-enabled devices. Such an environment requires the kind of balance that usually requires the expertise of a systems engineer. It’s likely that the explosion of IoT will mean many more opportunities for engineers in this field. Bringing connectivity to a mechanical device is no easy feat. It represents an extremely complicated and multi-faceted task that holds plenty of engineering challenges. In the past several decades, products have grown more complex. Organizations have largely responded by breaking the design process down into smaller and smaller steps, so that many engineering teams use a component-level approach. While this bottom-up methodology facilitates thorough verification of components, it can also contribute to issues later in the process when components are assembled into a system. The approach can also mean unnecessary back-and-forth as different engineering teams have to communicate and implement product design changes using disparate software systems. Adding electronic components to a product doesn’t just change the functionality of the product and the parts required. It also introduces additional size, weight, power and cooling (SWAP-C) considerations. An IoT device requires parts to connect it to the network, along with parts to keep it powered without overheating. In many cases, these parts must also be added without appreciably changing the size or weight of the product, or causing the product to get too hot. Wearables are an excellent example here. From hearing aids to pedometers, these devices must be small and light enough to be convenient for end users. Wearables also add a closely related challenge because there are strict limits on emission of electromagnetic waves in proximity to living tissue. The products that enable connectivity were once restricted to relatively safe, stable environments. Think about computers: even fifteen years ago, most computers were bulky and immobile, tethered to a single workstation in a relatively controlled environment. Engineers didn’t have to think too much about potential wear and tear from frequent transport. Today, laptops are ubiquitous, and engineers must keep in mind that most consumers won’t always provide the ideal environment (or handling) for these complicated devices. Building components and products that will withstand less-than-ideal or even harsh operating conditions presents a significant challenge for engineers. From a simulation perspective alone, engineers must simulate a much wider range of use conditions. IoT-enabled devices are designed to provide a reliable stream of data 24 hours a day, seven days a week. While this constant stream of data offers a treasure trove for engineers who wish to make data-driven product improvements using real-time, real-environment information, it also presents a challenge in terms of data storage and analysis. The sheer volume of data can easily exceed the storage capacity of most engineering firms’ in-house HPC clusters, rendering it essentially useless for product design. The engineering community has long embraced simulations as an industry best practice. Indeed, the most successful organizations incorporate simulations early in the product design process to inform decisions throughout the process--using simulations has been shown to increase profit margins on new products by as much as 15%. In the age of IoT, simulations are more important than ever. Boston Consulting Group has even named simulations as a critical success factor in the connected economy. The introduction of electrical systems introduces multiple layers of additional complexity that preclude the use of a traditional build-and-test approach. Yet on-premises HPC clusters often offer insufficient computing power for the increasingly complicated simulations necessary for developing IoT-enabled devices. Running simulations in the cloud has emerged as an ideal solution to this issue. Cloud-based simulations give engineering teams the ability to scale up as needed. For example, a consumer electronics firm might use cloud simulations to test the durability of a new phone design in a range of environmental conditions. Or a medical device company could use cloud-based CAE to incorporate performance data from a wearable device into the design of another similar device. Meanwhile, using multidisciplinary software enhances engineering teams’ ability to efficiently collaborate on the development of IoT devices. While the evolution and proliferation of IoT has presented numerous challenges for engineers, it also offers great potential for growth. Cloud-based simulations are an excellent way to harness those opportunities. Cloud computing can be a key enabler to capitalizing on these opportunities, by aligning your objectives with those of your executives. The UberCloud executive value guide gives you the ammunition you need to convince your executives about the value of cloud computing.